Riverside Cottage sometimes limits bookings to 7 or more days. Three bedrooms (1 twin, 2 double), three bathrooms, kitchen/dining room, living room with wood burning stove, patio area on the front and the back. Please note this property has a strict Friday changeover day. Riverside sometimes limits bookings to 7 or more days. 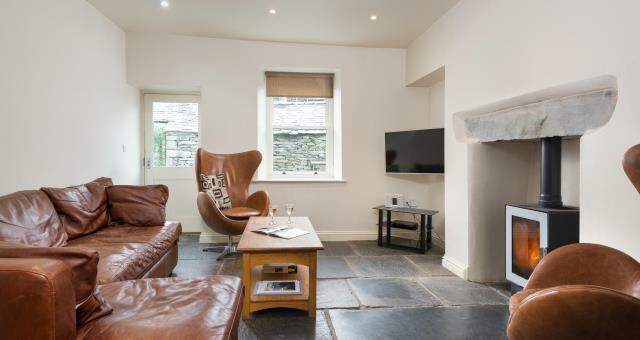 Riverside Cottage is a beautifully fitted three bedroom home, sleeping up to six, situated in the world famous Grasmere Village, in the heart of the Lake District National Park. Surrounded by stunning scenery it sits adjacent to the river Rothay as part of a secluded terrace/cul de sac just minutes away from the centre of Grasmere Village. Three large en-suite rooms are located over two upper floors. 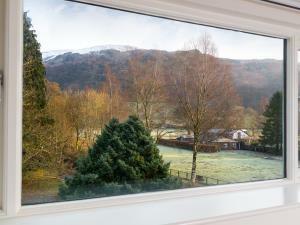 All the rooms have superb views over Grasmere and the surrounding fells. Guests of Riverside Cottage can enjoy reduced entry at the Langdale Spa. Vouchers available at the Traveller's Rest Inn at £5pp. Children welcome from any age.